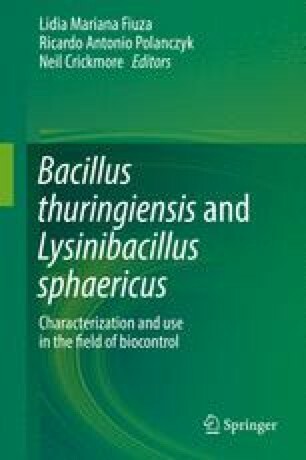 Bacillus thuringiensis (Bt) are Gram-positive bacteria that produce different insecticidal proteins, named Cry, Vip, and Cyt, during the sporulation phase of growth. Here we will describe each one of these classes of protein, their mechanism of action, and their three-dimensional structure if it is available. We will also describe the different strategies that have been used to find novel insecticidal genes that could be used in biological control of insect pests as well as the strategies to evolve known genes to produce proteins with improved toxicity against selected insect pests. These novel strategies include site-directed mutagenesis and domain swapping among different Cry toxins where novel hybrid proteins containing domains or loop regions from different Cry proteins were constructed, resulting in improved toxicity against selected insect pests. Finally we will describe high-throughput systems that have been used to evolve Cry toxins in vitro. Overall, Bt toxins represent one of the most successful strategies for the biocontrol of insect pests.